Transcribe, annotate and geo-tag the wide range of documents on the website. Receive due recognition for your hard work in transcribing and annotating. Accumulate points ('Miles') each time you transcribe. You can acquire new levels and capabilities according to your number of points, and compete with other transcribers to make it on our Top Transcribers list. Gain full access to our special thematic Runs, competitions and Transcribathon events. Send and receive comments and messages to discuss or ask for help on a transcription. Join and create Teams to share the transcribing fun with others. Keep up to date with new activity via notifications. Simply complete the online form on the Registration page to get started. You will need to create an original username and password, as well as provide your current e-mail address and let us know what your mother language is. For attribution purposes, you should tell us your full name when creating your account. You can, of course, later remove it from public view via your Account Settings. Changes to your notification settings can be made at any time in your Account. By joining our community, you are able to create and customise your own public profile for other transcribers to view. Access and edit your profile by simply logging in. On your profile, you can upload a profile picture, a cover image, and let everyone else know a bit about yourself in your About section. Your statistics, activity, and a list of all the documents you have worked on are shown publicly under ‘Transcriptions’ on your profile. This is a good place to check on your progress and get back to documents that you want to continue working on. Other users can also see your comments and replies from the Notes and Questions chat box (see Messaging) under ‘Comments’ on your profile. The private messaging system is used to discuss stories, items, transcriptions, and annotations with other transcribers. Communicating with each other is a great resource when you need help. Find other transcribers through the Members Directory, or by clicking their username in the Transcription History of each item. Then, press the Message button on their profile. Private messages are displayed in chat boxes, and only you and the other transcriber can see your conversation. If there’s something you want to share, you can also discuss items publicly via the Notes and Questions chat. Make a comment on the item, ask other transcribers for help, or assist those needing help by posting a reply. The Notes and Questions chat box is found on the lower-right of each item view. Other than transcribing documents alone, it is also possible to create and join teams with other transcribers. There are two different types of teams: Open teams and Private teams. You can join teams for a variety of reasons, for example, if you want to transcribe a specific type or language of document with others, to join a special event, or simply to transcribe with your friends. It is possible to be a member of several Open and Private teams at once. You can find the Teams portal in the Teams & Runs section on your profile. Open teams are public teams that transcribers can freely join at any time. They are open to everyone and you can freely join as many as you would like. Under Open teams in the Teams portal you can see all open teams that are registered on Transcribathon. Click on the Join icon to join any of these existing teams. Once you are a member of this team, your progress will be combined with other team members. You can access the Team Page at any time through your profile under Your Teams. Like Open teams, Private teams work together on Transcribathon on a permanent basis. These teams are private and transcribers cannot join freely, but must be invited by the administrator of the team or have access to the team code (generated by the administrator). Private teams are particularly important for Special Transcribathon events, which regularly take place in different cities across Europe. In order to take part in these competitive events, transcribers are asked to create or join Private teams, through which their combined progress during the event will be recorded. Participants of a Special Transcribathon event cannot join more than one Private team that is part of the event. Once the event is over, these teams can continue transcribing as a regular Private team. To create a new team, find the Teams portal and fill out the form that appears after clicking Create a Team (pictured right). You will need to decide on a team title and an abbreviated title that will appear next to your username. You can then write a short description of this team, for example, to state its purpose. To create an Open team, leave the code field blank. To create a Private team, click the refresh button next to the code field to set an access code. 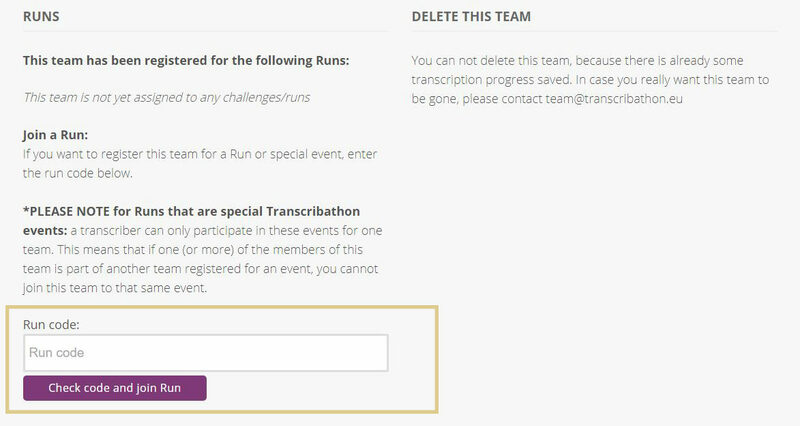 If you want to create a Private team for a Special Transcribathon event, type in the special code under Run code in the Create a Team form (pictured right). This code will be distributed to you either online or at the introductory events. To join a Special Transcribathon event with an already existing Private team, the administrator of the team must register on behalf of all team members. 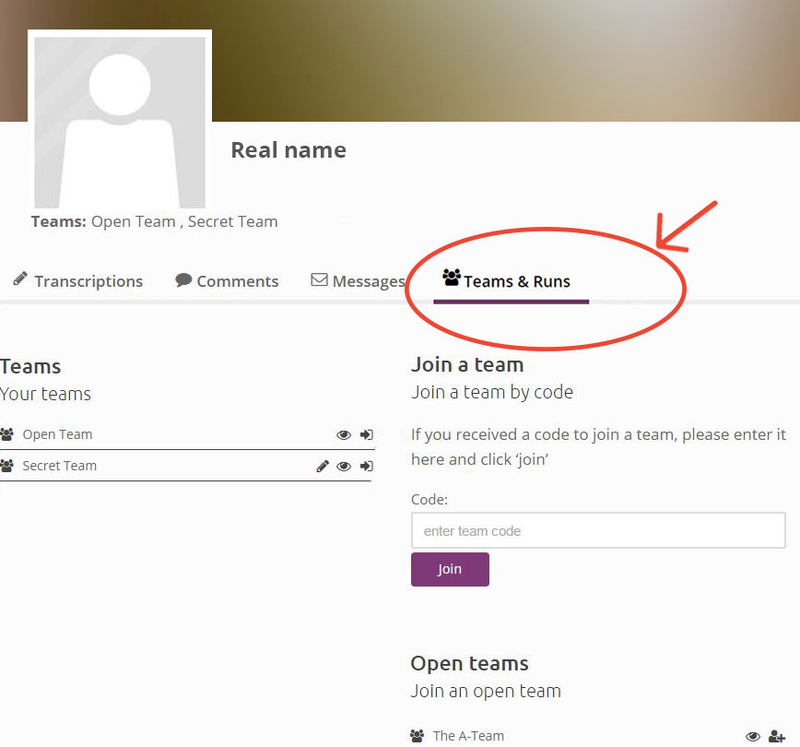 As an administrator, you can do this on the Teams portal by clicking the pen icon next to the team name under 'Your Teams', and then typing the run code under RUNS (pictured below). Once you have joined teams, you can access the Team Pages at any time through your profile on the left-hand side under Your Teams. On the Team Page, you can see the other transcribers in your team and keep up with your team’s overall progress on the Transcribathon. Your team’s progress is determined by the total miles and characters of each team member. Find out more about our points system here. The Top Transcribers page displays a Top Teams ranking list, where you can see where your teams rank in comparison to others. To communicate with team members, you can send private messages to other transcribers by clicking the ‘Message’ button on their profile. Type in your message in the chat box. You can then access all of your chats and continue to communicate in the ‘Messages’ section of your profile. You can also publicly discuss problems with particular documents through the Notes and Questions chat on the lower-right of each item view. You can either write a new comment or reply to each other through this tool. Every time you contribute to a transcription on Transcribathon Europeana 1914-1918, you will receive points. On the ‘Transcribathon’ these points are called ‘Miles’, signifying the distance you have run since staring the race. You are awarded Miles for completing individual tasks and accomplishing certain volumes of work. When writing transcriptions, your Miles are reached according to how much you have written overall. For more details, see our Rules for Miles by Transcribing. You can find your Miles and Total Characters on your profile under 'Transcriptions'. To ensure our point system is fair, and that users are merited by their real volume of work, Miles for transcribing are given in relation to how much you have actually written. These points are awarded according to the Total Characters you have transcribed in your overall history, regardless of how many items you have worked on. Your Total Characters are calculated by the accumulative number of characters from each of your saved transcriptions and edits. Formatting and spaces do not count as part of your total characters. In addition, no Miles are awarded for the use of special tools, such as geotags, comments and descriptions. Each time you write a transcription and save your work, the amount of characters you have transcribed are automatically added to your Total Characters. You reach a certain distance (No. of Miles) once you have reached the according Total Characters Milestone. When you have just started transcribing and have written and saved a transcription of 250 characters, you are awarded 1 Mile. Because you had prior only 1 Mile (for creating an account), your total Miles become 2. If you already have, let’s say, 11 Miles and 7200 Total Characters, and you have just written (and saved) a transcription of 300 characters, you reach the 7,500 Total Characters Milestone and reach the distance 15 Miles. This gives you a total of 16 Miles, including the one Mile you initially received from creating an account. Additionally, because you have now made it past 25 Miles, you level up to Runner, which unlocks new capabilities for transcribing. A user can only receive these additional 7 Miles per 1,000 characters after reaching a Total Characters Milestone of more than 10,000 characters. As you accumulate Miles, you also run closer to reaching a new level and obtaining the special abilities that come with it! The Transcribathon does not end at Champion level! Users can continue to transcribe Miles and Miles further, and their hard work will still be duly recognised. The transcribers with the most Miles achieved are given acknowledgement in our Top Transcribers list. All transcribers are automatically in the running, but only few make it to the top. Compete with others and transcribe your way to the lead! Keep your eyes peeled as rewards are sometimes given to our most diligent transcribers, especially during competitions. See who is leading now!